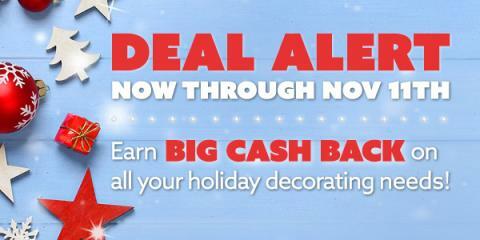 Click here to see the stores offering deals and cash back. Click through to the store(s) of your choice and do some shopping! Get cash back in the form of points (called SB) that you can redeem for free gift cards so you can stretch your holiday (and decorating) budget even further! I have been using Swagbucks for years now. When I signed up, we were broke college students with a baby. The gift cards I earned were very helpful in buying extra diapers and wipes as well as Christmas gifts. Now, were on our feet and I'm still using Swagbucks. I try to save them for Christmas purchases unless a good deal comes that's too good to pass up, like my new T-fal Deep Fryer. I paid $8 out of pocket for it!